Personal research requires you to look inward towards your own nature, and to take responsibility for your karate; to step out of your comfort zone. You can do this by attending events like open courses if you like, but in truth, such challenges do little to aid your progress. Personal research requires you to look inward towards your own nature, and to take responsibility for your karate; to step out of your comfort zone. You can do this by attending events like open courses if you like, but in truth, such challenges do little to aid your progress. There is only so much you can learn about yourself training in a room with a hundred others. To bring your self into sharp focus you need to experience a sense of being alone and an awareness that you have nothing to rely on but your self, your understanding of karate, and your ability to bring into play everything you have spent years learning. When you train under these circumstances your personal strengths and failings come to the surface; the choices you make when this happens will chart your progress. Of course placing yourself in such situations is not easy, but then, we are talking about karate training here: it’s not a knitting circle! If you’re wearing a black belt and still looking for the easy option when it comes to training, then you really have lost your way. You can pontificate over, and justify, your lack of personal courage all you like, but your failure to act is all that’s needed to demonstrate your unwillingness to go deeper. Pass all the grading tests you want, but remember, real advancement in karate is based on your depth of experience, skill, and understanding, not your rank! As the title of this article suggests, research is often difficult; but it’s not impossible. Actually I would argue strongly that difficult research is a vital element in gaining a deeper understanding of the karate you are working so hard to understand. If the people who have attacked my opinions on karate over the years had travelled a similar path to mine, I would be far more inclined to listen to their criticism, however, when I read comments like “we can’t all afford to go to Japan,” I know I’m often reading the adolescent bleating of an immature coward—A person who is aware of his own deficiencies and sees them highlighted in my comments regarding karate training. Taking the easy option, and maybe feeling embarrassed by their own lack of courage, they lash out at me, or rather, what my writing represents. I would argue there are a great many karateka practicing Japanese karate who could afford to travel to Japan, but choose not to; why they make that choice is for them to struggle with, I have made my opinion on the matter crystal clear. Standing outside the Goju-ryu dojo of Morio Higaonna sensei in a tiny backstreet in Naha, Okinawa, back in February 1984 was difficult. It was physically difficult to get to Okinawa from England back then, difficult to find the money to go, difficult to understand the language and customs, difficult to sleep on the floor, and difficult to eat the food. The karate was difficult too, as my training for the ten years leading up to knocking on his dojo door had been in Shito-ryu. My 2nd dan rank in that system wasn’t going to count for much in a Goju-ryu dojo which, at that time, had seen less than a handful of foreigners walk through its door. Being told to keep wearing my black belt was difficult, as was the invitation to stand on the front row during training. 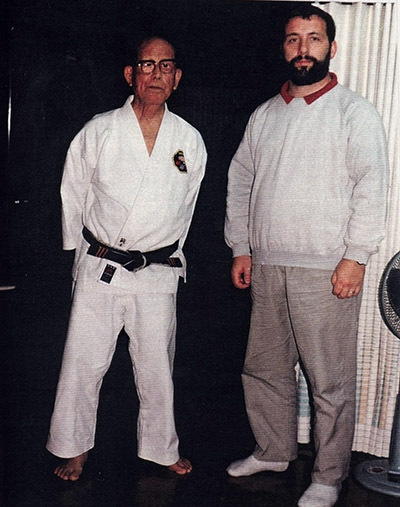 Having to make my karate work against unfamiliar methods of attack from well seasoned 5th dan’s, one of whom, Kazuo Terauchi, was the Tokyo All-Styles kumite champion, was difficult, and facing several weeks of uncertainty each time I went to the dojo twice a day was difficult, too. When I think back, there was very little that wasn’t difficult on that first trip to Okinawa, but without experiences like this in my life, my karate would not be what it is today. I look back on times like this, and others, and still feel a quiet sense of achievement…“I did that!” Over the past thirty-seven years there have been many similar experiences, where I put my karate on the line while conducting difficult research, and learnt much about myself as a result. Perhaps now would be a good time to ask yourself what your reasons for training are. Once you have indentified the reason(s) you will also know if you have been doing all you can to achieve the aims you started out with; exactly what kind of training have you been putting your self through? If you have been challenging yourself regularly, that’s great, but if you haven’t then maybe you have some soul searching to do. The old saying that karate training does not build your character, it reveals it, applies here. Why you fail to take up the difficult challenges karate training puts before you will reveal to you your true nature; the excuses you come up with as a result of those revelations, will reveal your nature to everyone else. Talk is cheap, and excuses are even cheaper. In karate you are judged on what you do, not what you say you will do. You are accepted in the dojo because of the efforts you make, and not on the efforts you once made. If you think karate is difficult when you’re young and strong, you should try it when you’re not so young and no longer have the body you once had. If you think being advanced in years is reason to slack-off and back away from doing the best you can, then you’re clearly as lost now as you ever were. Karate training, regardless of what age you are, should remain both physically and mentally challenging, otherwise it is no longer karate. Training according to your capacity to deal with the challenges you set yourself is the way sincere karateka continue to make progress: at any age! Always reaching for that which remains tantalizingly out of reach is the hallmark of an authentic karateka. Resting on the things you did in the past, is as hollow as having nothing in your past to rest on. For all its difficulties, karate training is also a great pleasure, and it becomes more than a pastime once you begin to accept ownership and make your karate your own. To do this you will have to conduct research into the history and techniques of the tradition you are at present a living part of, as well as examine your own nature. However, let me make this point clear; putting yourself in places where the most progress is made will take some courage, attending a few courses outside your dojo is a good start, but that’s all it is: a start. Going to Japan with a group of twenty or thirty others is better than not going at all, but it isn’t really what I’m talking about either. To ‘meet’ your self you need to be alone. You need to have no allies on the dojo floor, and only yourself to talk things over with afterwards. This is how you get to know who you are, and what you’re made of. That said, to continually face your self in the dojo over the course of many years requires a level of integrity, tenacity, and spirit, which few in karate today seem willing to adopt. Here’s what the late Shoshin Nagamine sensei told me when I met him back in 1992. “In karate we have a principle called Shin Gi Tai – Spirit, Technique, Body. This means to do karate well and to understand it, you have to harmonize these three things. Today I think there is an over-emphasis on Gi and Tai [technique and body], while the Shin [spirit] of a person is often neglected. Technique and power seem to be the only reason some people are doing karate today and this is now becoming a big problem. We should not forget to build a person’s spirit and character. I believe the decline has come about because too many people want to do karate just for sport or business. To adopt the principles of Shin is very difficult and takes a long time. People today want things too quickly, and so it is easier to train just your body, without the discipline of Shin. Developing your body and mastering the use of karate techniques, through the cultivation of your spirit, is the traditional way to develop your understanding of karate. Without difficult research, undertaken with an open mind and a genuine desire to learn, what you’re left with is no longer karate; but a mere illusion of it. So…how is your research going?